A blowout preventer controls, seals and monitors oil and gas wells by preventing an uncontrolled flow from the well reservoir. Since critical to the safety of crew, BOPs are precisely manufactured and every single component should meet most stringent standards. The door of a blowout preventer allows quick access to the rams and their replacement. The door seals the BOP and holds the rams at their positions, either opened or closed. This makes it a component of a critical importance that needs to resist the pressure of the operating blowout preventer. 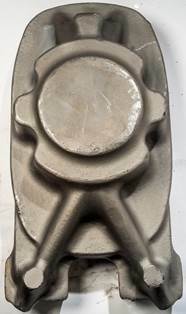 Forging provides better material properties and a higher level of quality of the endpiece at a competitive cost compared to casting. The forging division of Farinia Group - Setforge manufactures strong and reliable doors for blowout preventers. Farinia Group is committed to precision and quality control at every manufacturing stage. Therefore we are an internationally recognized partner of a wide range of industries. All our components are manufactured in state-of-the-art forging shops supervised by experienced engineers. Do you need a similar component? Over the years, Farinia Group has taken on new and tough challenges and built a solid expertise in the manufacturing of high-quality parts.